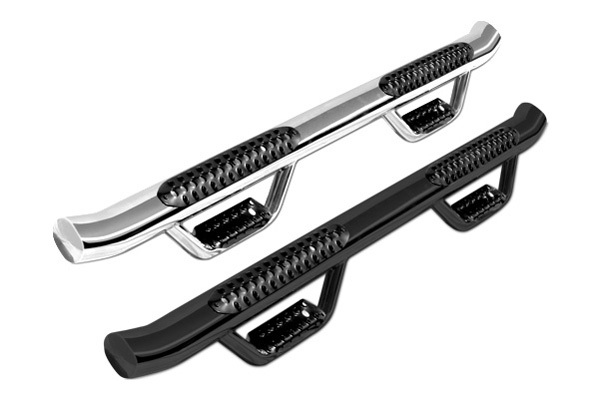 Interesting side bars for Ford F-150 2009-2014 - Ford F150 Forums - Ford F-Series Truck Community. Tall, lifted trucks can be a hassle to get into and out of if you have to leap just to get into the driver's seat. Two of our famous manufacturer's - Westin® and Go Rhino® - have cool pairs of side bars for last body style Ford F-150 2009-2014.
make your vehicle more stylish and practical. They have mild steel construction, mounting kit included and they are baked with 3-year warranty. They are available for SuperCrew and SuperCab models, in Polished Stainless Steel and Black Powder coated finishes. Go Rhino® - 4" OE Xtreme Wheel-to-Wheel Oval Side Bars offers you the replacement for the original bars, they are rust proof and made with Wheel-to-Wheel length technology. All this guarantee your truck an extra touch of finished-off custom style. Also available for SuperCrew and SuperCab models, in Polished Stainless Steel and Black Powder coated finishes. Go Rhino® - 4" Dominator D4 Series Dual-Step 1-Piece Oval Side Steps are specifically designed for each application and permit ultimate access for any lifted or taller pick-up with larger wheels and tires.They definitely will make your truck look more aggressive and cool. Which ones do you think would be the best for your truck?